Mackie Research commences TAG Oil coverage. Mackie Research, which focuses on Mining (Gold) and Energy (Oil E&P), recently initiated coverage of TAG Oil. Strong results at Sidewinder-1 flow test. It’s a thing of beauty! Done with our 10-day sustained Sidewinder-1 production test and it’s all good. We drilled to a depth of 1601m and encountered 14 meters of net (22m gross) oil and gas bearing sandstones. 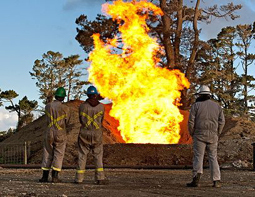 We achieved stabilized flow rates of 8.5 million cubic feet of gas plus 44 barrels of oil per day for a total of 1461 barrels of oil equivalent (“BOE”) per day, with a flowing tubing pressure of 940 psi. The 4-Point Isochronal test indicated a tubing restricted maximum gas flow rate of 13 million cubic feet per day (2167 BOE’s/day). This may be a flow rate record from the Mt. Messenger Formation. Better still, we’ve ID’d several other lookalike prospects to drill within the permit, many accessible from the same Sidewinder surface location. Time to commercialize this discovery and initiate oil and gas production.